Guess what? I am getting an apartment!!!! I went to a birthday brunch with my parents this morning and they told me about an apartment that they knew was available! Now, the boy and I have been looking to purchase a home since last year, but as luck would have it, we will be settling down and renting (eek!). There are so many responsibilities that come with leasing, I really hope we can pull it off. In the meantime, I am already thinking of color palettes for the apartment. I am thinking Mediterranean blues with hints of silver. 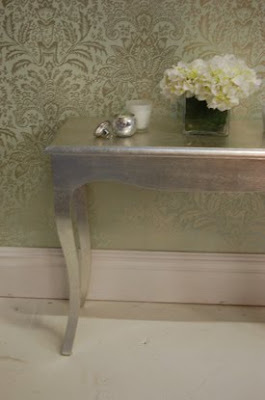 I saw a show on DIY Network that featured a silver leaf dresser and that is EXACTLY what I want! Jenny Komenda of Little Green Notebook, posted this amazing Silver Leafing Tutorial. I think her furniture came out looking AMAZING! Read her tutorial below and stay tuned for more updates about the new a-Patty-partment! Tell me what you think about my color palette in the comments below or on facebook.com/thesobremesa. 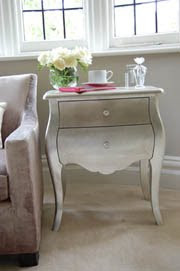 I love the glam factor that mirrored furniture can bring to a room! 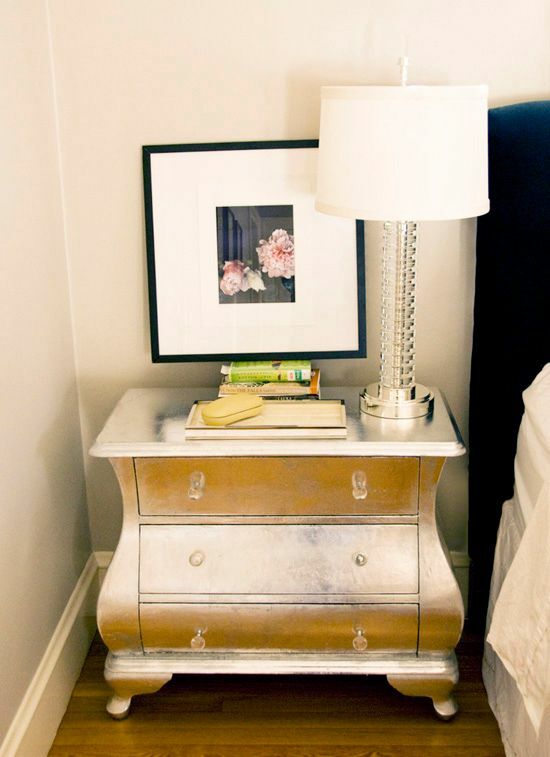 My Rhode Island client and I were really hoping to get a little of that glam into her bedroom. 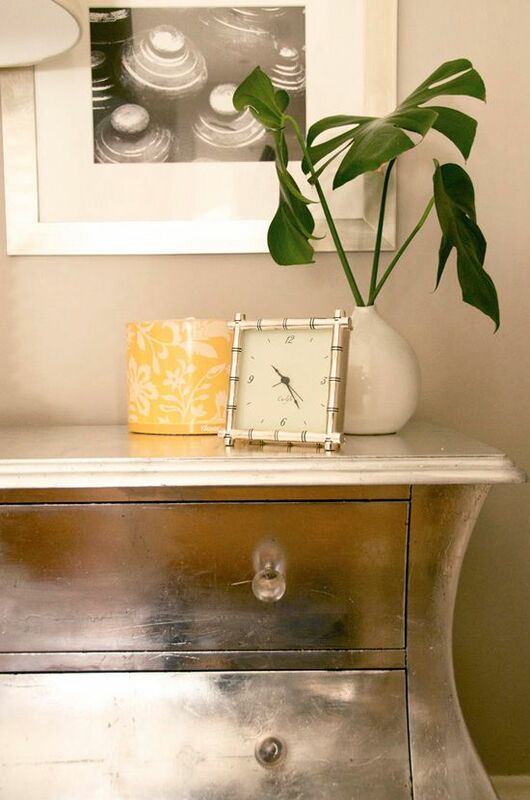 Unfortunately, mirrored furniture is really expensive – even the cheapy stuff from Target or Pier 1 was cost prohibitive in this project.When I found this image from House Beautiful, I was inspired to look into getting mirror custom cut to fit a boxy and inexpensive dresser. That also turned out to be completely out of our price range (several hundred dollars for just the mirror for each dresser). We both thought the silver leaf was a good alternative and decided to take the plunge. I found two bombay chests at HomeGoods that were on clearance for $75 because the paint was chipping. The size and shape were perfect for the room. Once home, each dresser was lightly sanded over the chipped parts and then given a coat of chocolate brown paint (Ralph Lauren’s ‘Galvenized’). 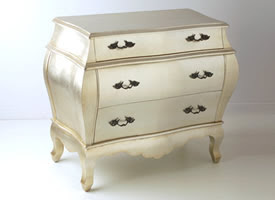 Once the paint had cured, I coated both dressers with 3-hour Quick Set Gilding Size, available here and at most art supply stores. I used about a pint between both dressers. The gilding size acts as the glue that holds on the leaf. It’s applied just like a varnish, and after waiting for a specified time, the size becomes tacky and is ready to be gilded. There are many types of metal leaf. 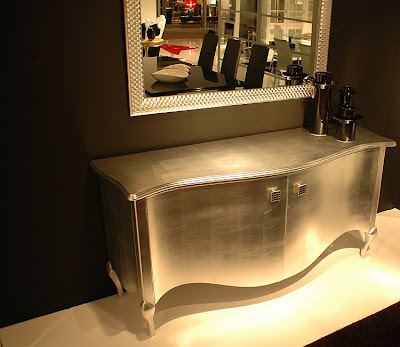 For this project, I used aluminum leaf because it was the brightest silver tone and looked the most to me like mirror (and the bonus is that aluminum is less expensive than silver leaf). A box of 500 5.5″ x 5.5″ sheets is $40-$50 and was more than enough for these two dressers. As far as application of the leaf goes, the basic idea is to carefully lay the sheets down with as little folding of the leaf as possible. Then using a soft bristled paint brush, just tap, burnish and rub the leaf down. It gets really easy with practice – you’ll feel like a pro after only 4 or 5 sheets. 2. Start with a flat, horizontal surface (like the dresser tops) to get the technique down before you attempt the vertical front or sides. 3. Once you’ve burnish one leaf sheet and are ready for the next, place that next sheet slightly on top of the already burnished leaf. By overlapping the sheets a little, there will be less of a gap/crack and the resulting look will be more seamless. 4. I ended up sort of liking the cracks and gaps in the gilding (it looks like antique mirror to me, with the chocolate brown base peeping through), but if you don’t want to see the “imperfections” just use a bit of extra leaf and rub it into the gap or crack with your finger and the size will quickly pick up the leaf bits. 5. I was shocked at how resilient the gilded surface was after the size had fully dried. My client opted not to seal the finish because she wanted it to gently wear over time, but it would be easy to apply some Wipe On Poly to protect and seal the gilding. The process looks more intimidating than it really is. While it’s sort of time consuming, I was able to catch up on my tivo-ed shows while I gilded (do you spy my remote?). We used vintage lucite knobs from eBay as a final touch and I think that really moved these formally “Olde World” Homegoods dressers in the “Glam and Gorgeous” category. Thanks for the tutorial, Jenny! Purify Your Life: Air Purifiers Worth The Money 5 Uses for Plastic Bags A Printable Guide to Seasonal Cleaning Is Your Rent Too High? Check to See if You’re Overpaying!